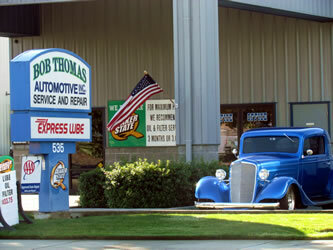 Bob Thomas Automotive, Inc. is a full service automotive repair facility in Medford Oregon, servicing the Rogue Valley for more than 19 years. Our friendly and knowledgeable staff will help you get your vehicle running perfectly! With all of our technicians being ASE certified, some as master technicians, you can rest assured your vehicle is in good hands. BTA provides unparalleled customer service and quality repair that enables us to build long-term relationships with our clientele. We are proud of our reputation of professionalism and honesty in the valley. Come in and experience the advantages that our independently owned service center can offer you! When you need scheduled maintenance, tune ups, repair, or other services for your vehicle, our ASE-certified technicians are here for you! Bob Thomas Automotive is able to serve our fleet customers better than ever with our dedicated 6,000 square foot shop expansion. Our goal is to exceed our customers’ expectations by continually providing superior quality automotive maintenance and repair services in a clean and friendly environment and in a timely fashion, while building a trusting relationship. Our customers are our primary focus and what drives us to do everything possible to ensure their complete satisfaction. Join Bob Thomas Automotive on Facebook for special offers, discounts & tips on auto repair & maintenance! In addition to our general special offers & coupons, BTA offers savings through Employee Discount Programs, and to senior citizens and those who support us in various ways. Bob Thomas Automotive makes it easier for our customers to be sure they are up-to-date on their scheduled maintenance services by email, or postcards by mail. Just one less thing our customers have to worry about! View other Bob Thomas Automotive commercials!